View Talay 1. A very tidy studio unit in an extremely popular building, known for its good central location to the beach and dining/entertainment, and facilities on site. 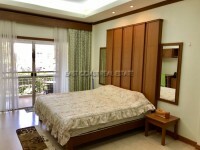 This unit is on the 13rd floor and is rented complete with all the furnishings. A nice sized living space with Air Conditioning, and cable TV. The complex has 2 very large swimming pools and all amenities are only a few minutes away and include Jomtien Beach, international restaurants, bars and nightlife, laundry and local taxis. Owned in Foreign Name with 50/50 tax and transfer fees. Available with a minimum 12 month rent with 2 month holding deposit.